A holistic research based health home in tune with traditional Indian holistic health care by Yoga Therapy, Ayurveda, Naturopathy and Modern Medicine for the treatment of life style related ailments. Prevention and treatment of diseases. Trained post graduate yoga therapists teach special techniques for specific diseases. Daily medical supervision by doctors. 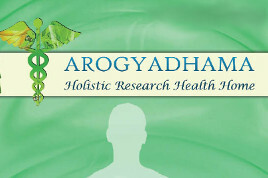 Qualified expert senior physicians of Modern Medicine, Ayurveda and Naturopathy. A. Neurology: Epilepsy, Migraine, Parkinson’s, Muscular dystrophy, Cerebral Palsy, Multiple sclerosis, Mental retardation. Oncology: Breast cancer stage 1, 2, 3, 4; Colon, Prostate, Blood, Myelomas. B. Pulmonology: Bronchial Asthma, Nasal Allergy, Chronic Bronchitis, COPD. Cardiology: High BP, Low BP, Heart Disease (CAD). E. Spinal disorders: Acute and Chronic Back Pain, Lumbar Spondylosis, Disc Bulge, Disc Prolapse, Scoliosis, Neck Pain. F. Metabolic disorders: Diabetes, Hypothyroidism. G. Gastroenterology: Gastritis, Peptic Ulcer, Irritable Bowel Syndrome (IBS), Ulcerative Colitis. Eye Problems: Short Sight, Long Sight, Astigmatism, Squint, Early Cataract, Glaucoma. Integrated Approach of Yoga Therapy (IAYT) derived from Yoga texts is using Simple, safe, doable, practices that include Asanas, Pranayama, Kriyas, Meditation, Science of Emotion Culture, Svadhyaya, sleep special technique. Specific Yoga techniques based on research data selected individually administered Yoga Therapy by therapists with Post Graduation qualification after detailed examination and thorough check up. Yogic counseling based on texts of Yoga comprising of Jnana Yoga, Bhakti Yoga, Karma Yoga and Raja Yoga. Ayurveda: Panchakarma treatments following the traditional system of management with technical support from ‘Arya Vaidya Pharmacy’, Coimbatore. Naturopathy: De-stressing & Detoxifying treatments with latest modern equipments like Delux Under Water massage, Jaccuzi, Colon Hydro therapy, Swedish massage, Aroma therapy, Steam bath, Sauna bath, Mud therapy & Acupuncture/Pressure – administered by qualified professionals.